Breast Implants Linked To Rare Cancer : Shots - Health News The FDA says breast implants with textured surfaces are linked to at least 203 cancer cases, and that nine women have died. 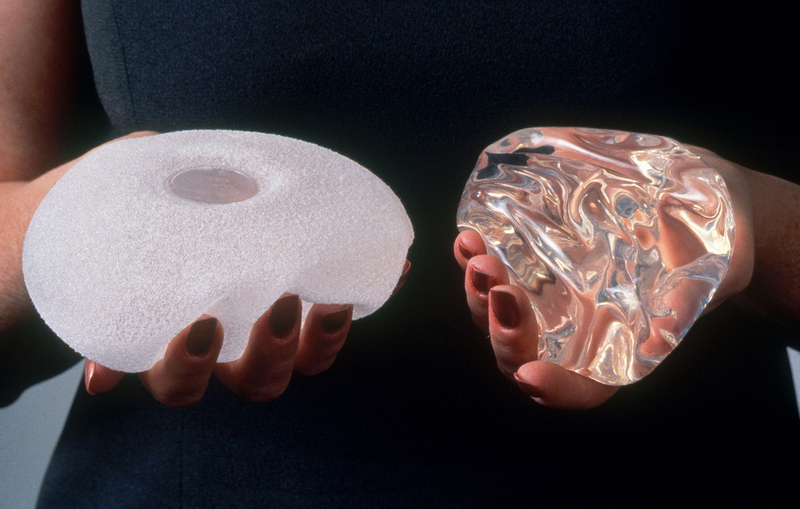 Nearly 300,000 people get breast implants each year in the U.S.
A textured breast implant, left, and a smooth breast implant. The Food and Drug Administration says at least nine women have died of a rare blood cancer after receiving breast implants, and that the agency is officially acknowledging an association between the implants and the disease. On Tuesday, the agency announced that as of Feb. 1, it had received 359 breast implant-associated reports of a rare type of non-Hodgkin's lymphoma called anaplastic large cell lymphoma, or ALCL. The cancers were more common in women who had implants with textured, rather than smooth, surfaces. About 290,000 people received breast implants in the U.S. last year, according to the American Society of Plastic Surgeons, which does not track the surface textures of implants in its yearly reports. Of the 359 cases reported to the FDA, 231 had information on the types of implants. Of those, 28 of the cancers were in women who received breast implants with smooth surfaces and 203 were in women who had a version with a textured surface. It is still unclear whether the texturing is actually responsible for the cancer, or is just associated with a higher incidence of the disease. The surfaces of the textured implants are designed to allow tissue to grow around the interstices of the implant surface, explains Dhivya Srinivasa, a plastic surgery resident at the University of Michigan and the lead author on a recent review of data on breast implant-associated ALCL worldwide. The texturing can help prevent a surgical complication called capsular contracture, where the scar tissue around the implant becomes hard and painful. "There's many kinds of texturing, and different companies do it differently," Srinivasa says, so it's difficult to know what specific quality of textured implants could be associated with the cancer. Doctors and researchers have been investigating a connection between breast implants and ALCL for years. The FDA first reported on it back in 2011, but did not cite any reports of deaths from the disease and said there were too few cases to conclude anything beyond a "possible association between breast implants and ALCL." Since then, the Plastic Surgery Foundation has launched a reporting system specifically for doctors to report cases of the disease in implant patients. Last year, the World Health Organization classified breast implant-associated ALCL as a separate diagnosis, and authorities in Australia and France took steps to track and assess the connection. A study published earlier this year estimated the lifetime prevalence of ALCL in people with textured implants is 33 per 1 million persons. That rate is about 65 times higher than the overall risk of developing ALCL if you do not have breast implants. Women choose to get receive breast implants for multiple reasons, including to replace tissue removed as a result of breast cancer or during cosmetic surgery to make breasts larger or change their shape. More women with breast cancer are choosing to have mastectomies rather than less-invasive procedures that leave part of the breast intact. But as NPR's Patty Neighmond has reported, there is evidence that a full mastectomy with reconstruction "is more costly and has more complications after surgery than lumpectomy with whole-breast irradiation, while the rate of cancer recurrence and survival is essentially the same under both regimens."